As Kava Kava becomes more popular and Kava Bars are springing up all over the place, people are looking to get the relaxing experience of downing a few shells at home, partly because it works out cheaper but also because there isn’t always a Kava bar near where you live. 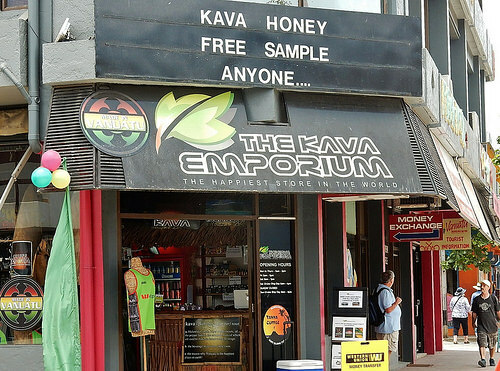 There actually aren’t all that many Kava stores near to anybody, that is unless you live somewhere like Fiji or Vanuatu where Kava is a staple. If you are lucky enough to live in one of those beautiful Pacific Islands you can just pop down to the local market or Nakamal and pick up some Kava whenever you need it, but for the rest of us that rely on imports – where is the nearest place that sells Kava? Personally, I would avoid buying from bricks and mortar stores, unless you know that they are getting fresh noble kava on a regular basis as you just don’t know exactly where they are sourcing their product or how long it has been sitting around on the shelves. You can get so-called Kava products, powders, capsules, concentrates, extracts and mix drinks, as well as kava tea bags from local health stores like GNC, Trader Joes etc. but the quality can be poor and is usually part of the mass production machine where you’re going to get very little bang for your buck and a weak kava effect. You’re unlikely to find many specialist Kava Stores like the one pictured above (Kava Emporium in Port Vila, Vanuatu) unless you live in a Kava growing area but there are definitely a few around if you’re lucky enough to hear about them. Nowadays with fast shipping and delivery prices (including Amazon Prime) it’s actually a very good idea to buy Kava online.Not only are the Kava specialists that sell online more likely to reach larger audiences, hence selling more Kava and therefore keeping fresher stocks, but the variety and ability to stock new cultivars in the fast moving Kava world (deliberate Oxymoron!) is much enhanced. If you’re after the Kava Candies that I mentioned in my Kava taste post check out the Love Kava store.